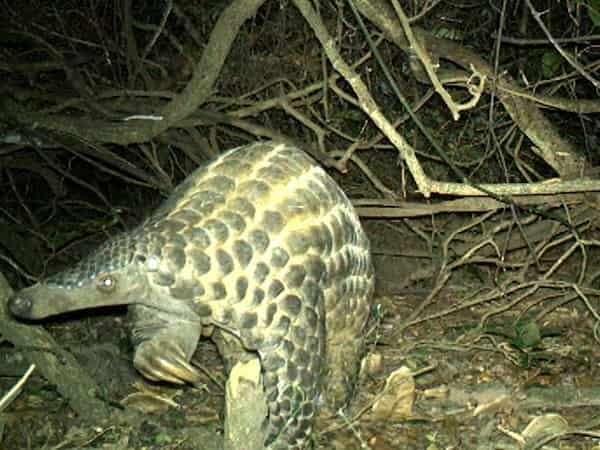 The footage of the creatures, captured by Chester Zoo conservationists, shows a pangolin, known as scaly anteaters for their protective armour, sitting on its powerful tail while grasping a tree with its claws. Meanwhile in another segment observed by the remote-operated cameras, a baby clings to the back of an adult as it rummages through bushes. Researchers hope the imagery could provide new insights into the secretive nocturnal species only found in equatorial Africa, which are being pushed to extinction by illegal hunting for its scales and meat. "With no giant pangolins in zoos or safari parks anywhere in the world, all our conservation efforts must focus on saving them in the wild," Stuart Nixon, Chester Zoo's Africa field programme and research lead. "The race is on against criminal networks that only value dead pangolins, to save this species and protect them well into the future." The footage was captured by 70 motion-sensor trail cameras installed by the zoo's team at Uganda's Ziwa sanctuary, in east Africa. The giant pangolins, one of four species in Africa, live there alongside protected rhinos but are increasingly threatened by poaching. "Being nocturnal, rare and very shy it's only with new technologies such as high sensitivity trail cameras that we are able to learn more about how they live and interact with each other and their environment," added Nixon. Sam Mwandha, the executive director of the Uganda Wildlife Authority, hailed the rare glimpses of the giant pangolins as "very exciting". He stressed the need to "protect and conserve this highly threatened species for future generations".